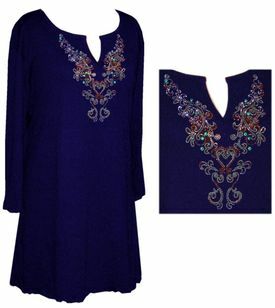 These are really pretty machine washable poly/cotton blend shirts, with beautiful rhinestone embellishment around the neckline. The sleeves are appx 3/4 length, and the shirts are extra long with side slits. These shirts are gorgeous, the pictures don't do them justice!